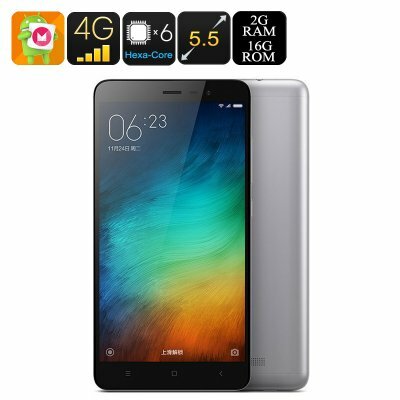 Successfully Added Xiaomi Redmi Note 3 Pro - Snapdragon 650 CPU, 2GB RAM, Dual-Band Wi-Fi, 4G, Adreno 510 GPU, 16MP Camera, Dual-SIM (Grey) to your Shopping Cart. Being among some of the first phones out there ever equipped with the state of the art Qualcomm Snapdragon 650 CPU, the Xiaomi Redmi Note 3 Pro is one of the fastest devices in the markets that is guaranteed to handle the most demanding tasks in a split second. Get ready to raise your smartphone user experience to an entirely new level with this magnificent Chinese smartphone. Along with its ultra fast and powerful Hexa-Core Snapdragon 650 CPU that has been clocked at 1.8HGz, the Xiaomi Redmi Note 3 Pro features an Adreno 510 GPU and 2GB of RAM. All this serious hardware provides you with an extremely powerful smartphone that is capable of handling all the latest Apps, most demanding games, and FHD movies without dropping any frames. A massive 4000mAh battery backs up this epic smartphone, providing you with hours of continuous usage time, enough to get through the day without the fear of running out of power. Enjoy all your favorite games, Apps, movies and more on the 5.5 inch FHD display of this Android smartphone. With Google Play installed the Xiaomi Redmi Note 3 Pro brings along countless hours of fun and mobile entertainment. Faster Wi-Fi is something we all crave for. Featuring 4G and Dual-Band Wi-Fi this Android phone provides you with the fastest data connectivity out there. Being dozens of times faster than a regular Wi-Fi connection Dual-Band connectivity allows you to download files of staggering sizes in the blink of an eye. Holding a magnificent 16MP rear camera the Xiaomi Redmi Note 3 Pro gives you the means to snap pictures of breathtaking quality. Capture all those amazing moments in life and share them with friends and family in stunning clarity – with its 16MP camera this android smartphone turns every special moment into an unforgettable memory.